We had barely left, making our way to Denver International Airport, leaving Colorado, when Sally pointed to the left and said, “That’s Erie,” the town where The Dog Stars takes place. She said, “They have airstrips instead of driveways.” Then we had a debate—thanks to Amy, I mean Dr. Sekhar—about how they go to the post office or dinner in Denver, how they find parking for their airplanes, those wild Erie-landers. The view from the top of Yankee Hill, halfway through our off-roading trip. Sally conceded that, yes, they probably do have driveways at their homes, but they really loved their airplanes. I conceded that, yes, I’d bought the book based on her recommendation while Stephanie and I were in Denver. So everyone was happy, and Sally was able to continue listing points of reference, the Colorado geography that would enrich my reading. 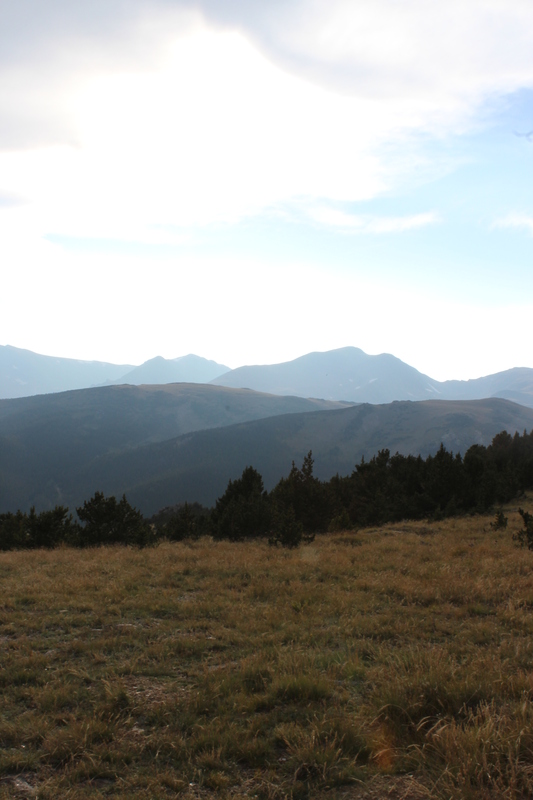 She pointed out the front range and the different peaks. She told me about the dog, Jasper, which I couldn’t picture, seeing as Max the wonder dog was sitting half on my lap in the cramped Kia. But that’s all over. We made it past the evil bronco statue to the airport, and I miss Colorado, all of it. I miss it holistically, if that makes any sense. Now that I’m back home in flatter than flat Indianapolis, and I finished the book, I wanted to thank you, Sally, for all of your hospitality during our stay, your cards and consideration over the years, and your friendship, by telling you what I think. So here it goes. 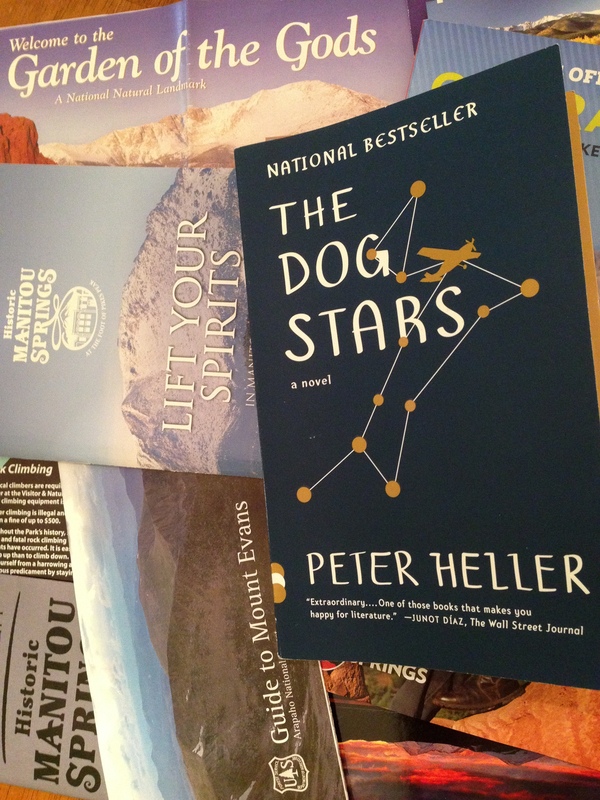 SPOILER ALERT: If you think you may ever read The Dog Stars by Peter Heller, read the book first. Bottom line, it’s fairly graphic but worth your time. I felt it was worth mine, at least. The basic gist of the book is a catastrophic disease has wiped out North America, and only a few scrappers, bitterly holding on to life, are left. They automatically assume anyone they don’t know is out to get them and kill indiscriminately. Men, women, children. They’re not running around marauding—not the main characters, at least. But they defend what’s theirs, a small airport and surrounding houses in Erie, giving no quarter. Anyone who steps on their land is good as dead. The first thing I noticed is the fragments. Peter Heller’s use of sentence fragments is laudable. It seems lazy or sloppy, but it’s not. It’s something that you have to commit to, something that goes against everything you learned, everything you know. The Dog Stars, with some other survival guides. But then again, what about a post-apocalyptic Colorado hellscape does accord with polite society and all the meaningless ticks society develops in us over time? But I’m still undecided, because it morphs into a blend of the two. Not just fragments. Not just complete. It’s a nice blend that keeps the tone of the book. Thesis, antithesis, synthesis. The thing about The Dog Stars is: Jasper, the dog, is a prominent character, and he meets the fate of most dogs in popular media. But it’s much sooner than usual, and I spent the rest of the book missing him. Hig mourns the dog, which would seem out of place for anyone in his situation, but not for Hig. It barely makes sense why he is still holding on to his humanity, thinking, feeling, but he is. So Hig is allowed to cry, to pine and emote. He should be dead already but was just intelligent and lucky enough to make a deal that saved his life. He said he could fly reconnaissance for a gun-obsessed survivalist named Bangley, his savior. Bangley is officially from the shoot first, ask questions later school, and he chides Hig for recreating, which I thought was pretty funny. After Jasper meets his end, quietly in his sleep, Hig decides to set off West over the mountains to find the phantom who called out over the radio three years ago. On his way, he gets distracted by an old man and his not-so-old daughter. The old man doesn’t see Hig as a threat, thinks he’s soft, but he doesn’t tell Hig this. Hig and the girl, Cimarron, start to fall for each other, forcing them to work through their complicated past relationships. They reflect on the spouses they lost to the plague. Eventually, they all work it out to leave in search of the phantom voice and enough fuel to get back to Erie. When they get to the Grand Junction airport, Hig gets nervous and pulls up just before the residents spring a trap to crash the plane. This whole section resolved really quickly. Hig and Pops took out the two old, crazy cat people in no time. After he’d wondered all that time, it was dissatisfying to have such a quick, meaningless interaction with these people. But what could he have found there that would satisfy him? In the end, you know a little bit more about the time when the disease spread across the U.S. However, Hig’s place in the world isn’t any better established. He has a new “wife” and a family, and he mostly stopped caring about what is out there. And maybe that’s the point. Maybe Heller wants us to feel that if we have people we can love in our lives, who support us, then we can finally stop worrying about what dangers are against us out there.